Fedora Nightlife is a new project for creating a Fedora community grid. People will be able to donate idle capacity from their own computers to an open, general-purpose Fedora-run grid for processing socially beneficial work and scientific research that requires access to large amounts of computing power. Given the large number of Fedora users, I hope that we will eventually be able to build a community grid of over a million nodes at Fedora. This will be a great example of the power of the Fedora community, give people new and meaningful ways to contribute to Fedora, advance the development of large-scale grid software, and lead to real benefits for the world. Fedora Nightlife will leverage the Condor project, which was (http://www.cs.wisc.edu/condor/) created and hosted by the University of Wisconsin Madison, for scheduling and harnessing donated computing power. Last year, Red Hat and the University of Wisconsin signed a strategic partnership around Condor. Part of this partnership entailed releasing Condor's source code under an OSI-approved open source license. As a result, we now have Condor packaged at Fedora, and upstream development continues to happen at the University of Wisconsin repository in an open manner. We've already started working on getting a scheduler up and running. I should have a wiki setup relatively soon so that we can start mapping out more plans there. Then, we can focus on growing the Nightlife community of projects and solicit Fedora users to donate capacity. Hopefully, enabling donation of compute power to Nightlife can eventually become a first-boot option for Fedora installs. I welcome everyone to contribute to and participate in the Fedora Nightlife project! Fedora Nightlife is going to build on the work I do in my day job at Red Hat around Red Hat Enterprise MRG--it'll be based on the same technology we use for MRG's grid capabilities. This is great for me for a couple reasons: Fedora Nightlife will be a powerful and public example of the scale that's possible with Red Hat Enterprise MRG, and the work we do to drive Nightlife/Condor to the 1 million node count will directly benefit MRG. Also, it's great to be at a place like Red Hat where I can work on my product management job and do some good in the world at the same time. Insert your U727 into your laptop. The U727 has built-in flash storage for which Fedora will mount on your machine, launch a file browser, and show a link on your desktop. Close the file browser, and right-click the link to your flash storage and select to eject the device (note that unless you eject the flash storage, your modem won't work). Right-click on NetworkManager and select Edit Connections. Click on the Add button to create a new connection for your U727. 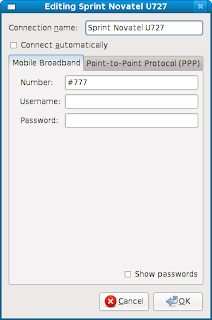 Fill in the new dialog box with the name of your modem's connection and the number to dial. 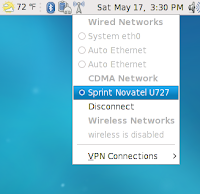 In my case, I named the connection Sprint Novatel U727. Type in #777 for the number to dial. Now, click on NetworkManager, and you should see your new USB modem connection show up as a connection option. 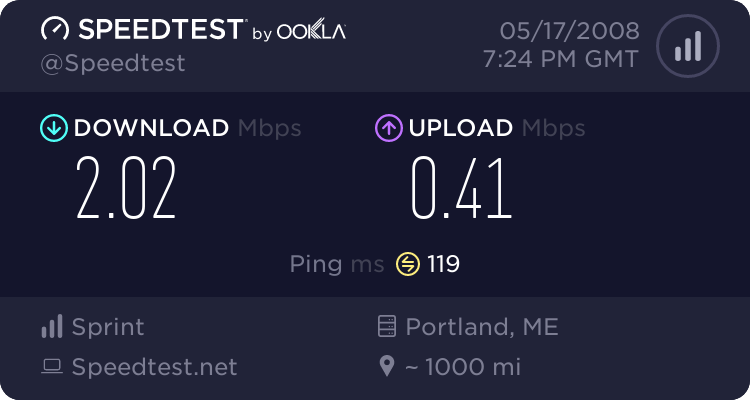 Select your new connection, and you'll be online!